sequality software engineering tailors software to your particular demands: Enjoy competitive advantages with individual software designed to exceed your expectations. With our expertise we support you in clarifying the general framework for your software project. How can software best support my specific needs? Which software solution will be the most effective one for my field of expertise? How can we make best use of the existing foundation with regard to technologies/products while keeping an optimal cost-benefit ratio at the same time? Which algorithms do we need to develop? The realisation of single steps (=iterations) supports the development of targeted software solutions tailored to your specific demands. Demo tests in close-to-real surroundings help to get a good overview on the future functionality of the new software. As sequality-customer you benefit from extensive test demonstrations in realtime. Due to the growing digitalisation of production processes, the display of two- and three-dimensional data becomes increasingly important. Appropriate modelling tools and the usage of high-performing frameworks support an excellent presentation and adaptation of two- and three-dimensional data. The implementation of such technologies and frameworks into industrial applications leads to a higher usability as well as a closer identification of the user with the system. Find more information here. Augmented needs for higher end-product supplies as well as increasing demands for user-friendly operation systems can result in software solutions based on Linux (e.g. Ubuntu Desktop or integrated solutions with embedded Linux) being the better choice. Developing links to standardised and automatised solutions via XML or open data bases is possible and leads to better and more secure results when using an industrial application developed with a standard technology (such as C++ or JavaFX). “Software application lifecycle” describes the fact that software has a limited period of operation and is subject to deterioration. Over time, it becomes more and more difficult to maintain its code. As a result, new requirements are either not met or their implementation is provisionary and associated with high efforts and costs: A re-orientation of the software architecture is inevitable and the basic technologies often need to be re-evaluated and newly selected. Sequality is your competent partner, supporting you with the re-orientation and implementation of your software system. This software suite consists of an operation system via touch screen, desktop viewer/editor for CAD models and an automatised engine for backdrop calculations. As such, the software coves the complete operational functions of the machine. It consists of a group of various industrial robots. 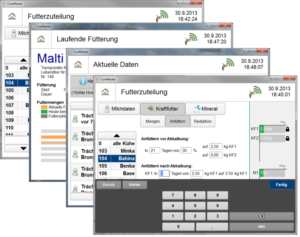 This software enables the configuration and operation of a cow feeding plant via an office desktop. 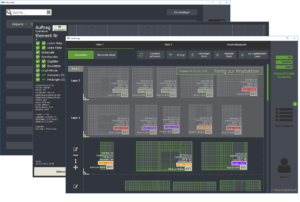 In addition to the software solution based on embedded Linux we developed a variation for Microsoft Windows: The latter includes an installer as well as a program wich automatically identifies the operational plant in the network (IP finder). The software “WWAngebot” automatically drafts official quotations and offers for civil engineers of the public water management. In addition to supplying the correct configuration of normed parts of the offers, “WWAngebot” automatically calculates the price in accordance with mathematical estimation formulas. The software also generates detailed service contracts in MS-Word. Contact us for further information on SEQUALITY industrial applications! Industry 4.0 with sequality: high-performing industrial applications for a user experience like on a smartphone or tablet.